Beauty Costs > How Much Does a Peacock Feather Cost? How Much Does a Peacock Feather Cost? A peacock feather is a decorative feather used for different purposes, mostly for aesthetic purposes. Peacock feathers have many different colors and are very vibrant, which is why these feathers are preferred to be used for decorations and sewing. 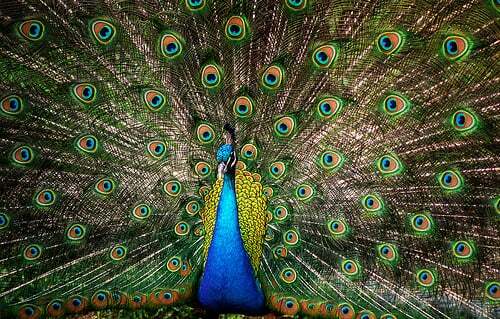 The more stunning peacock feathers come from the males, while female peacocks have natural brown tones. The price for peacock feathers will depend on the type of feathers, the number of feathers needed and where you purchase these feathers from. How much do peacock feathers cost? On average, peacock feathers can cost anywhere from $2 to as much as $70 for a pack of 100, depending on the factors mentioned above. For example, a 12 pack of natural peacock feathers retail for $5 to $13, while a 100-pack of peacock eye feathers, measuring more than 35 inches, can retail for $75 to $90. According to Featherstore.com, the price for peacock feathers can range anywhere from $5 to $65. A peacock feather has the trademark “eye” toward the top of the feather, and these feathers can vary in lengths, commonly measuring anywhere from 25 to 35 inches tall and one to three inches wide. No two feathers will be exactly alike. Peacock eye and tail feathers, for instance, will be commonly used for bouquets and house decorations, while the wing and body feathers will be smaller and ideal for smaller crafts. The colors of peacock feathers will be brown but may reflect blue, turquoise and green light. Peacock feathers can often be purchased online via specialty craft stores, on eBay or on Amazon. Before purchasing, just make sure you check out the retailer’s reputation and see what past customers said about the purchase. Peacock feathers are usually used as an added decorative material to a piece of clothing or material. Additional materials or patterns may be required depending on the type of job that you plan on performing. Some peacock feathers can be put in someone’s hair, and if you need a stylist to perform this job, this service can cost $5 to $15. Check with bulk purchases that have more than 100 feathers. Generally, the more that are purchased, the more you will be able to save per feather.